i've encountered a problem not allowing me to queue for both ranked and unranked pvp's. The queue buttons are not responding to my clicks at all. Hoping this gets solved asap! I'm having the same problem as the above where I cannot queue into PvP. The buttons are completely unresponsive. 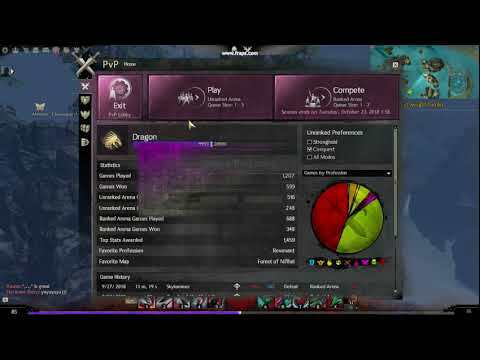 I have tried repairing the client by deleting the .dat file along with other files in AppData/Roaming/Guild Wars 2 multiple times but the issue persists. Any and all assistance would be of great help. I need help, cant play unranked or ranked. pressing "compete" button and nothing. Hello, I am stuck in queue for the past hour or so. The match never loaded and it now says 'match is about' to begin and 'leave queue' is grayed out. Please help! I have been unable to queue for ranked and unranked PvP matches on all of my characters for the past 4 days now. Submitted a ticket a few days ago and received a request for more information. I sent a video of the event to the GM yesterday morning and have not heard anything since. Needless to say this is extremely frustrating. My account is stuck in matchmaking que plus everytime I change an instance a window pops up with 7 "checked" players and I dismissed it and nothing happens. Logging off didn't help. I'm getting kicked out of fractals and raids because of it because it automatically leaves the party/squad im in it. cant do any team content basically. Just happened to me. Que popped. Then when it said match is about to begin, I got a "cannot access the login server at this time" message. Usually when that happens I get kicked to the character select screen. I logged out, exited the game completely. Restarted the game same issue. Everytime I load into a new map I get the match is about to begin with the checkmark screen pop up. Very annoying. You would think for a 6 year old game this stuff would be ironed out. Character Name I Shot Johnny. I've been stuck in a ranked queue for about an hour now. please resolve. Stuck in queue here as well. Hello, I am stuck in unranked Que and each time I change maps, the match ready screen pops up and it's very annoying. Please fix this asap since there is a lot of people dealing with this bug. I just stopped playing for 24 hours and it fixed. Me and AT team are stuck in queue for an AT that happened during a patch. I don't know if its possible to just end the at or what, but either way there's twenty people who can't queue on the account that was in the AT. Balthazar's Brawl at 23:00 server time on 10/16. I'm stuck in queue for an AT that happened during a patch. Stuck in queue. "Match is about to begin." Stuck in queue. "Match is about to begin". I am stuck in queue. "Match is about to begin". Im stuck on mapresults/Match is about to begin. Can't queue up for ranked or unranked. I click either and nothing happens. Been like that for over a day, tried relogging, rezoning, changing characters, everything. Please fix it for me! I’m stuck on pvp queue like the guys before me, please help! "Match is in progress" since 20 minutes. I won the game. It's been over a day now, are people still looking up into this ? EDIT: 2 Days stuck in "match is about to begin" . It seems that this bug is also preventing me from doing fractals of the mists because each time I try to enter I get "Lost connection with the server." 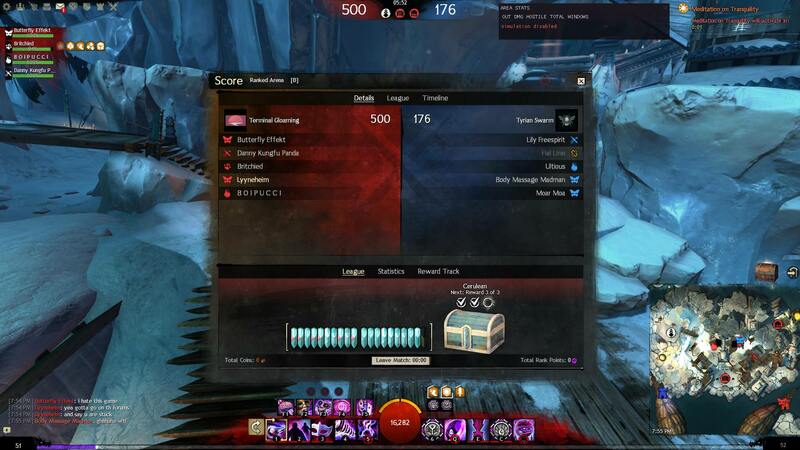 Raids and WvW seem to be working fine. Hi, the "map selection" screen (which pops up after selecting your map) is stuck. I can't get rid of it and I really can't do anything in game with a box right in the center of my screen. Please help. Again the same problem. Is there any way to fix it? ... please. I click on queue button for both rank/unranked spvp. But nothing happens after that no error message nothing just clicking the button don't do anything. I am currently stuck in a completed PVP match. Nothing seems to be able to free me! Hello, at 7:30 pm I was with my character, Arima, in a match ranked on the Revenge of the Capricorn map, after the game ended, my character got stuck on this map, and every time I try to leave my character returns to the same map. Please solve this.